Yauatcha takes pride in celebrating the Dragon Boat festival, an age old fair celebrated during the month of June, 5th day of 5th month of the lunar calendar to be more specific. I happened to accompany my friend who was invited to the preview of this food festival. The limited edition menu is going to be offered throughout the month of June and includes a selection of sticky rice dim sum alongside a dessert inspired by rice wine which is enjoyed during this festive time and an exclusive cocktail. 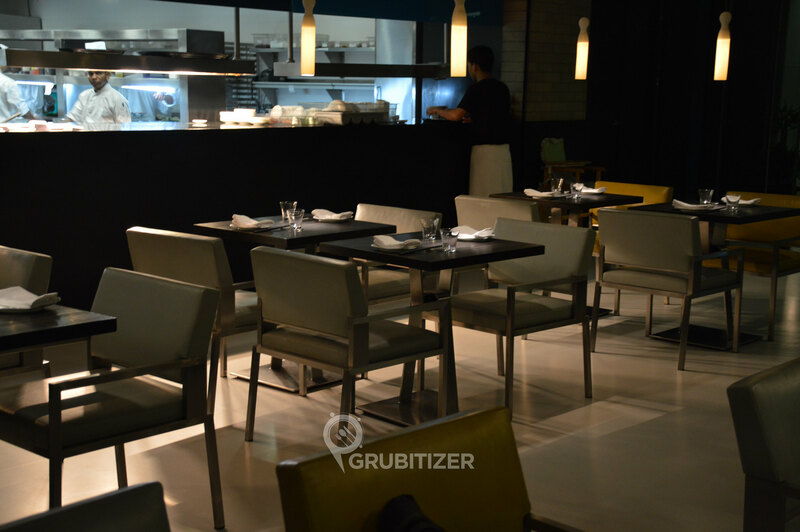 LOCATION – Yauatcha is located in 1 MG Mall which is at a stone’s throw away distance from trinity circle. It is housed on level 5 of this mall. The place is on the extreme left side and shares floor area with other premium restaurants. INTRODUCTION – Before we move on to see what exactly the menu looks like I would like to highlight the significance of this festival and how it is connected to food. The festival is being celebrated annually from past 2000 years, that’s like very very old, so automatically has a rich heritage associated with it. There are many legends circulating around the festival but the most popular one is that of Qu Yuan, an incorruptible minister and a patriotic poet (340-278 BC). He was banished by the emperor for reasons based on treason. During his exile he wrote a great lot of poetry. He drowned himself in the Miluo river after learning that his country was occupied and conquered by the State of Qin. This led to a lot of distress among the locals as he was loved by the common folks. Fishermen set out on their boats and tried to outrace each other to save him, or atleast find his mortal remains and this led to the origin of boat race. 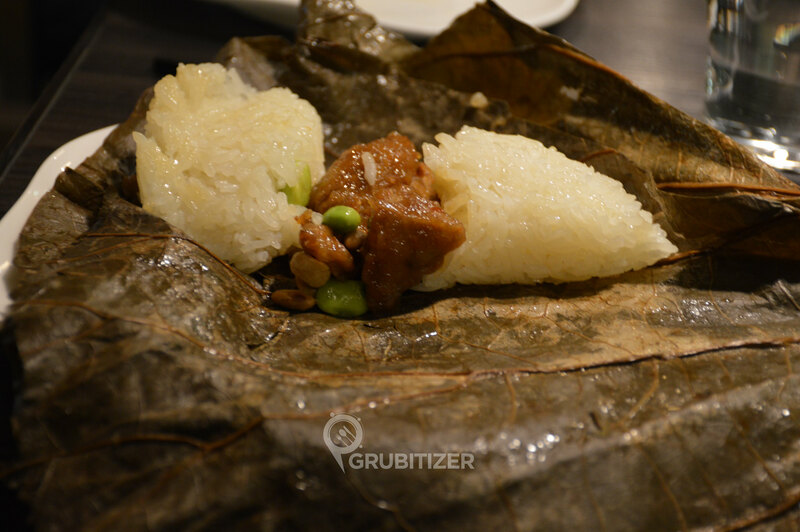 Others threw sticky rice wrapped in leaves into the water to attract fishes so that they spare Qu Yuan’s body, and this is said to be the origin of zongzi (glutinous rice). DINING EXPERIENCE – The special menu is available from which individual dishes can be ordered a la carte. 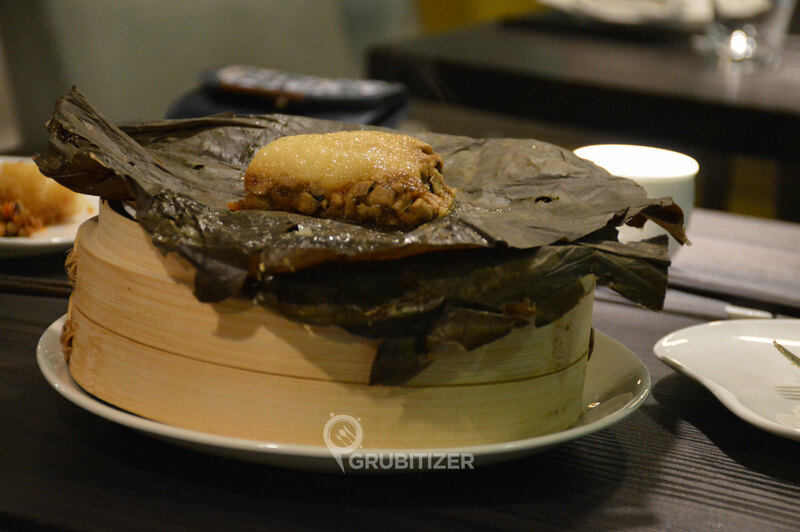 The rice dim sums are all served on lotus leaves which are either pyramid or rectangular in shape. Sticky rice with Chicken and Prawn. Sticky rice with Pork belly and shiitake mushroom. Sticky rice with pine nuts and lamb. I personally liked the Chicken and Prawn dim sum from non-veg section and vegetarian-duck from the veg one. 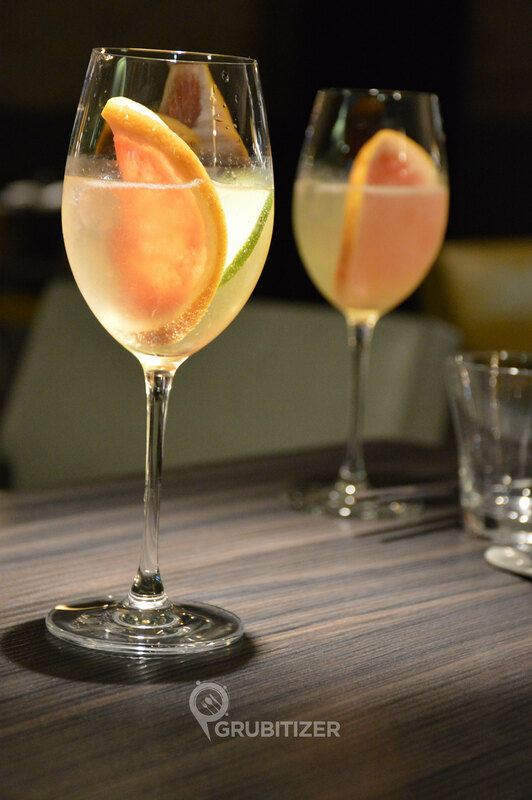 COCKTAIL – Citrus Spritz which was a potent mix of vodka, dry vermouth, lime and Chandon Brut. It is very strong but went well with the rice dumplings, which needs to have an acquired taste to enjoy it to the fullest. Finally the dessert arrived and it was by far the best presentation that I have come across. 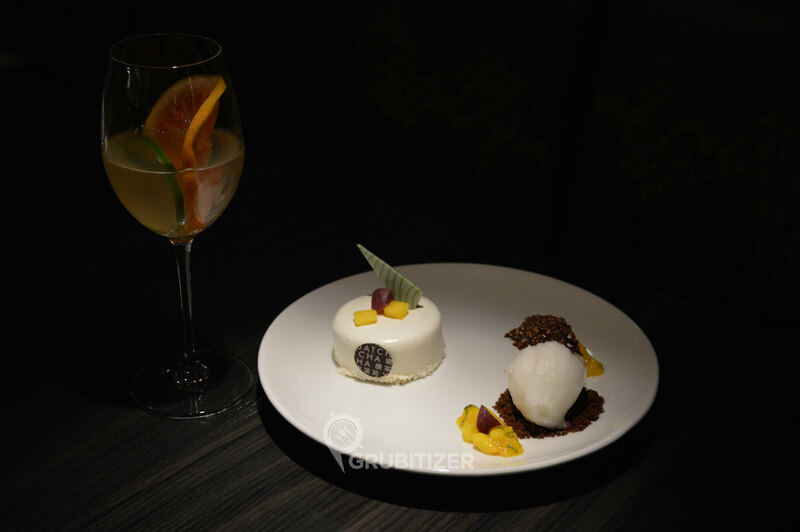 The platter had a ‘wine – soaked water chestnut and mango cake with Sauvignon sorbet’. Wine could easily be sensed in every bite which made it even more tasty and tempting. GRUBITIZER’s VERDICT – Time to summarize my overall experience! 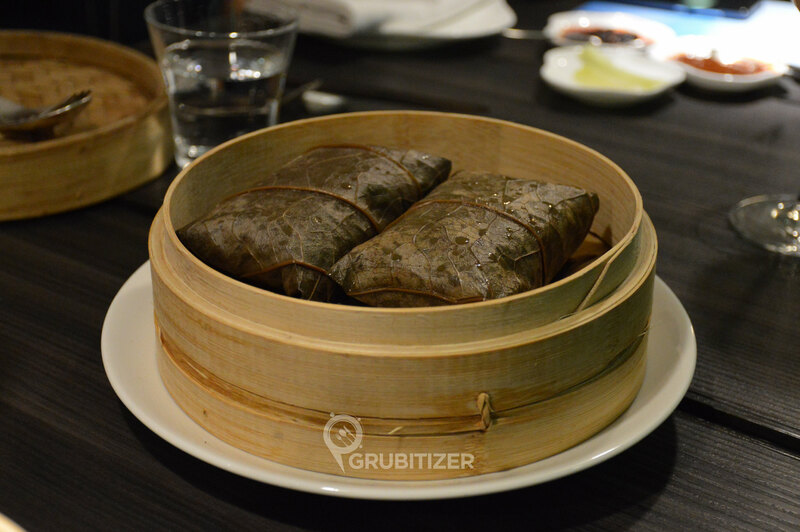 Well I loved the way how non veg sticky rice dim sums tasted and also the variety included in the menu, vegetarian folks might feel slightly left out because of having just two options! 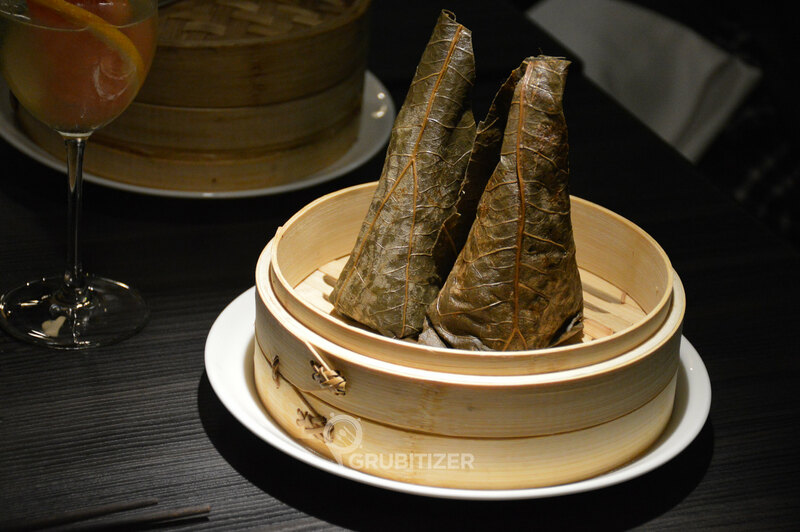 The leaves which wrap the dumplings are made out of lotus and emit a very different sort of aroma upon opening it. Service here was prompt and we did not have to wait long between orders. The cocktail served is very strong and if you like it otherwise then do let the serving staff know about it! Overall, the food is amazing, it is different and hence needs an acquired taste to relish this wonderfully laid out spread. Go head to Yauatcha and enjoy this culinary delight first hand to get the best out of this food festival which is going to be there till June 3oth. Find out more about the Yauatcha by clicking here.